Families will find a rich landscape of social opportunities to create bonds between children and between families. Wellspring Wednesdays provide an opportunity for Unity friends and family to share a meal and good conversation together. Following Wellspring Wednesday intergenerational chapel service, children play board games and make crafts together, forming church friendships that can last through the years. Wednesdays (September-May) • 6:45-8:30 p.m. Unity's Tween Group (grades 5-7) meets regularly during Wellspring Wednesday. The group gathers at 6:45 p.m. for worship in the Ames Chapel, then heads to Jr. High room 021 — the location for post-worship drop off (7:15 p.m.) and pick up after programming (8:30-8:45 p.m.). Guardians, please come and sign your kids in and out! 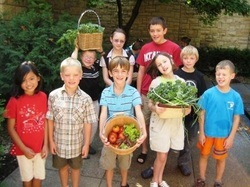 Tweens is led by Ray Hommeyer, contact them with questions at ray@unityunitarian.org. This entire production—from the script to the music to the choreography—is original material created for Unity’s 6th, 7th, and 8th graders. 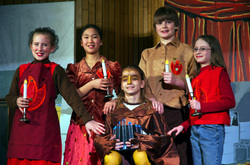 Participation in the Children's Musical has been a right of passage for many of Unity's youth. Auditions are held the first Sunday in January and performances are March 7, 8, and 9, 2019. 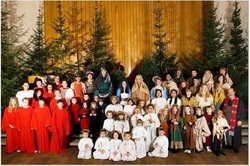 We invite our youth from kindergarten through 12th grade to join the Christmas Pageant cast! This is a honored tradition at Unity Church that you don’t want to miss! To bring this story to life, we need youth in grades 3-6 to make up our Children’s Choir; our K-2nd grade children to bring us a multitude of the Heavenly Hosts, Pages and Little Shepherds; and our 7-12 graders to bring us a flock of Shepherds, Acolytes, Kings, and Angels to bring this story to life. The Christmas Pageant services are held on Christmas Eve at 4:00 and 5:30 p.m. and all are welcome! Please contact Kelley Loughrey, pageant director, at kelleyloughrey@comcast.net with questions.